Gerard Deulofeu sparked a Watford comeback in a epic F.A cup semi final against Wolves. 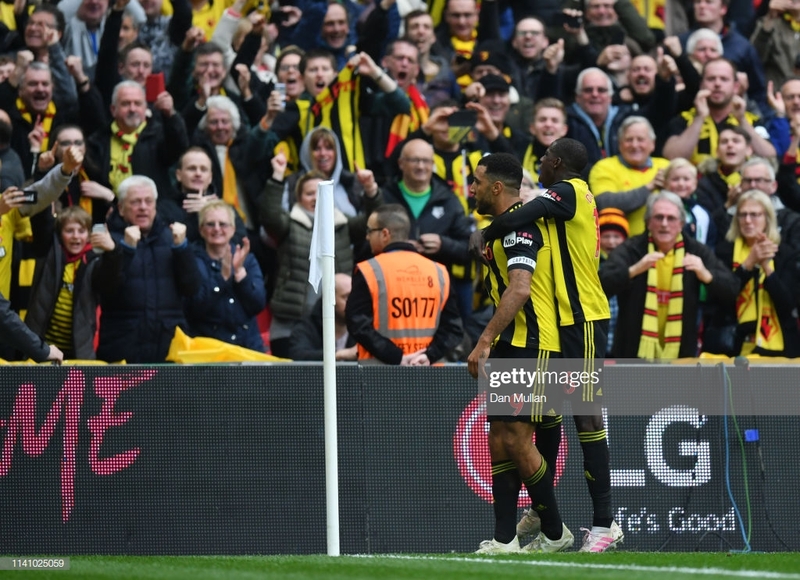 CWatford came from two goals down to beat Wolverhampton Wanderers 3-2 in a thrilling FA Cup semi-final. Two goals from Gerard Deulofeu and a penalty deep into injury time from Troy Deeney cancelled out goals from Matt Doherty and Raul Jimenez, as Watford reached the final of the FA Cup. Wolves started brightly and had their first chance after just 20 seconds, but Johnny's effort from outside the area went narrowly wide. This was the only chance of the first 15 minutes in what became a very expected cagey affair between the two sides. Wolves should have went ahead just before the 20 minute mark. Johnny crossed from the left after capitalising on an error from Kiko Femenia, but his cross wasn't met with any kind of conviction from Diogo Jota, and Watford cleared. Watford had their best chance on the half hour mark. Troy Deeney crossed from deep on thae left hand side to Andre Gray who fired over the bar. A difficult chance, but the best they could muster in the first half. Shortly after that chance Wolves went ahead. Leander Dendoncker won Wolves a corner with a shot from 25 yards. The corner was taken short and headed in at the back post from Doherty who had all the time in the world to put Wolves 1-0 up. Wolves clearly gained confidence from this, with Jota striking narrowly wide from 20 yards. They were then saved by captain Conor Coady who blocked Gray's strike at goal which was going in to send Wolves in at the break 1-0 up. 15 minutes after the break and Wolves went 2-0 up. Jimenez who signed a permanent deal for Wolves scored on the hour mark after chesting down and slamming home a quick free kick. The Mexican brought out a mask given to him by Sin Cara, the WWE fighter. Wolves looked comfortable but with 10 minutes to go, Watford got one back through some individual brilliance from substitute Gerard Deulofeu. He got the ball inside the box on the right and waits for the defender to give him just half a yard and curls the ball into the top corner. Watford dominated the last 10 minutes as they pushed for the equaliser but Wolves nearly made it 3-1. Doherty got in down the right and squared it to Jimenez but the ball was just pinched before he could strike goalwards. Jose Holebas had a chance from inside the area with three minutes of normal time remaining but he lacked composure and fired miles over. It looked like being the last chance for Watford, but in the second of four additional minutes, Watford were awarded a penalty after Deeney was clumsily brought down by Dendoncker. Deeney took and scored the penalty, smashing the ball past John Ruddy to send the game into extra time. Johnny had the first chance of extra time as the ball come to him on the left of the box, but his powerful shot was tipped over by Heurelho Gomes. With just a minute of the first half of extra time remaining, Watford completed their sensational comeback. Gray released Deulofeu and he got in behind the Wolves back line and calmly slotted the ball past Ruddy. Ivan Cavaleiro had the best chance to get Wolves level with the 120 minutes almost up. He gets into the box, takes the ball around Gomes and should really bring Wolves level but he fails to get a clean strike on goal, and Watford are able to clear. After being 2-0 up with ten minutes to go, Wolves would have thought they were home and hosed, with many fans probably thinking about the final. Well, it wasn't to be and after Deeney scored to send the game into extra time, the Wolves players looked exhausted and couldn't get themselves up for the final 30 minutes which in the end was their downfall. When Deulofeu came on for Watford, the game changed. He added that pace and quality that Watford required to get back into the game, and his brilliant run and finish in extra time sent Watford into the final to play Manchester City. Wolves just didn't handle him when he came on.